Print what you need to live on a new world ! NASA awarded three teams a total of $40,000 in the first stage of the 3-D Printed Habitat Challenge Design Competition at the New York Maker Faire on Sunday, Sept. 27. 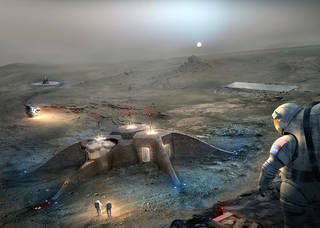 The design competition challenged participants to develop architectural concepts that take advantage of the unique capabilities 3-D printing offers to imagine what habitats on Mars might look like using this technology and in-situ resources. The competition is part of NASA’s Centennial Challenges program and is managed by America Makes, a partnership of organizations focused on accelerating capabilities and adoption of additive manufacturing technology. More than 165 submissions were received, and the 30 highest-scoring entries were judged, displayed at the Maker Faire event. 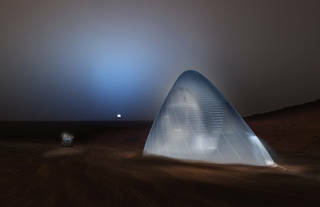 The first-place award of $25,000 went to Team Space Exploration Architecture and Clouds Architecture Office for their design, Mars Ice House. Second place and $15,000 was awarded to Team Gamma. Third place was awarded to Team LavaHive. The top 30 submissions can be viewed here. Teams were judged on many factors, including architectural concept, design approach, habitability, innovation, functionality, Mars site selection and 3-D print constructability. 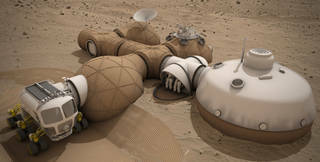 The design competition is the first milestone of the 3-D Printed Habitat Challenge, which seeks to foster the development of new technologies necessary to additively manufacture a habitat using local indigenous materials with, or without, recyclable materials, in space and on Earth. NASA’s Centennial Challenges Program is part of the agency’s Space Technology Mission Directorate. The program is managed at NASA’s Marshall Space Flight Center in Huntsville, Alabama. Learn more about the challenge at www.nasa.gov/3DPHab and americamakes.us/challenge. For more challenge and prize opportunities with NASA, visit www.nasa.gov/solve. Learn more about the winning team and Mars Ice House at www.marsicehouse.com.